It has only been mere months since the January 26 launch of the Pan Borneo Highway, which starts at Kilometre Zero, Telok Melano in Lundu District. Since then, Telok Melano, a once sleepy fishing village has seen an upturn in fortune. What started as a shelter during sea storms for traders from Sambas (in Indonesia) on their way to Kuching many decades ago has now turned into a popular tourist attraction. Telok Melano village chief, Hamizan Abdul Hasan, said that according to folklore, the name Telok Melano was derived from the shape of the bay and “pokok nor” (nor tree) which resembles a sago palm. With a small population of 305 people who are mostly Malays, the villagers now enjoy a steady stream of income from tourists visiting their beach. “The homestay business is doing well. Years ago, the guests came only on Fridays, Saturdays and Sundays. Now, houses are fully booked throughout the week. I would estimate that it is a 50 per cent improvement, but it is a 100 per cent improvement” Hamizan said confidently. Mere weeks after the launch of the Pan Borneo Highway when the number of visitors was at its peak, pictures of the beach littered with rubbish went viral on social media. When pressed about the matter, Hamizan refuted the photos, saying “the contamination or littering is a non-issue”. “Most of the rubbish was swept onto the beach from the sea especially during the monsoon season, so it is only a case of bad timing as you won’t find rubbish on other seasons,” he said. The newly found popularity of the beach is also not lost on the government service. 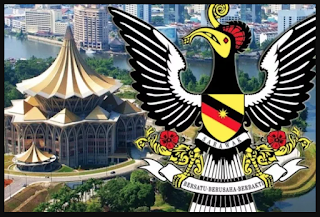 Last Sunday, for example, the Malaysian Anti-Corruption Commission (MACC) held a corporate social responsibility programme called “Enhancing Integrity Project (EIP)” there. Asked about what made the beach appropriate from the programme, MACC director Datuk Idris Zaharudin said Telok Melano is unique. What he meant was the spot is the location of the highway’s ‘Kilometer 0.00’ with an attractive beach right next to it. Government agencies are starting to take notice of the place and it is important for the villagers to maintain its integrity, especially its cleanliness, as the whole area is their source of income from the tourism. Baru Bian Wat Happen to you.. Jambatan Sabah Dinaiktaraf, Jambatan Di Sarawak Dibatalkan?